A selection of Reggiani’s aesthetically-pleasing Yori luminaires have been specially chosen for use throughout the reception area of the newly-revamped Davidson House situated in the centre of Reading close to The Oracle shopping centre and the mainline train station. The 10,940 sq. ft. space has undergone a complete uplift with the introduction of a totally refurbished, well-lit public walkway area through the building which leads seamlessly into the warm and welcoming new reception area. 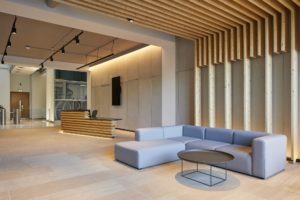 The refurbishment was designed to provide the owners with a more distinctive and inviting entrance that re-identifies Davidson House as a contemporary, forward-looking office space. Working with dn-a architecture, leading lighting design firm Light Bureau were given responsibility for the lighting throughout the exterior and ground floor spaces and specified Reggiani’s Yori fittings with a view to providing a lighting solution that was consistent in intensity and colour and which would enhance the natural wood design and help bring the exterior and interior spaces together. The external public walkway now incorporates a warm palette of natural materials including a timber fin design ceiling structure which links the north and south entrances as well as seamlessly connecting to the central interior space. Reggiani’s dimmable, track-mounted 22W LED large Yori fittings with a 30-degree beam angle and complete with a recessed honeycomb accessory were installed between the internal timber fins to create a soft, welcoming and relaxing atmosphere to the waiting lounge and also to support visual continuity with the adjacent passageway. 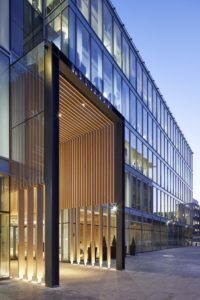 With the reception area also containing large floor-to-ceiling windows to the front of the building, the soft level of lighting complements and provides a perception of depth to the building façade when viewed from the outside. In contrast, the front desk located at the very heart of the building was expected to be a functional and fast-moving space that required a higher level of illumination and uniformity. For this, Light Bureau again chose Reggiani’s dimmable, large Yori fittings in black, but this time with a 52-degree beam angle on two rows of track suspended from the concrete ceiling to illuminate key vertical surfaces, support wayfinding and to entice visitors further into the interior space. Reggiani’s elegant suspended Yori linear fitting in black was also installed to provide a good, uniform light immediately above the building reception desk. 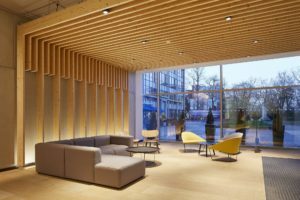 In complementing the natural materials used in the reception area Reggiani’s stylish fittings have once again helped create a well-lit, warm, welcoming and comfortable visual environment for staff and visitors alike.